Although HIMI is a sovereign external territory of Australia, we manage the World Heritage values for everyone in the world. Even though most people will never get to go HIMI, it enriches our lives to know that such a spectacular, wild and natural place exists! The subantarctic island group of Heard Island and McDonald Islands (HIMI) is located in the southwest Indian Ocean at approximately 53°S 73°30’E. The islands are approximately 4000 kilometres southwest of Western Australia, 4700 kilometres southeast of Africa and 1000 kilometres north of Antarctica. The nearest land is the French territory of Îles Kerguelen, an archipelago of islands approximately 450 kilometres to the northwest. See the Maps page for maps showing the location of HIMI relative to Australia, Antarctica and Îles Kerguelen. There are several other groups of subantarctic islands in the Indian Ocean, including Marion & Prince Edward Islands (South Africa) and the Îles Crozet (France), but their combined landmasses are tiny in the vast expanse of the Southern Ocean. Heard Island and the McDonald Islands lie in the furious 50s so named by the 18th century sailors for the persistently strong winds characteristic of the Southern Ocean (being around 50 degrees south latitude). South of the roaring 40s and north of the screaming 60s, the persistently poor weather, high seas and vast expanses of ocean resulted in the late discovery of the islands. While not the most isolated island in the Southern Ocean, Heard Island has seen fewer visits and fewer disturbances by humans compared with other subantarctic islands. Heard Island is approximately 40 kilometres long from the western tip of the Laurens Peninsula to the eastern tip of Elephant Spit, and 20 kilometres from Saddle Point on the north coast to Long Beach on the south coast. The island covers 368 square kilometres and is dominated by Big Ben, an active volcano of 2745 m elevation. See the Maps page for a general map showing the geography and topography of Heard Island and McDonald Island and go to the Nature section of this website for more information. Volcanic activity has been observed at Heard Island since the mid 1980s, with fresh lava flows on the southwest flanks of the island. 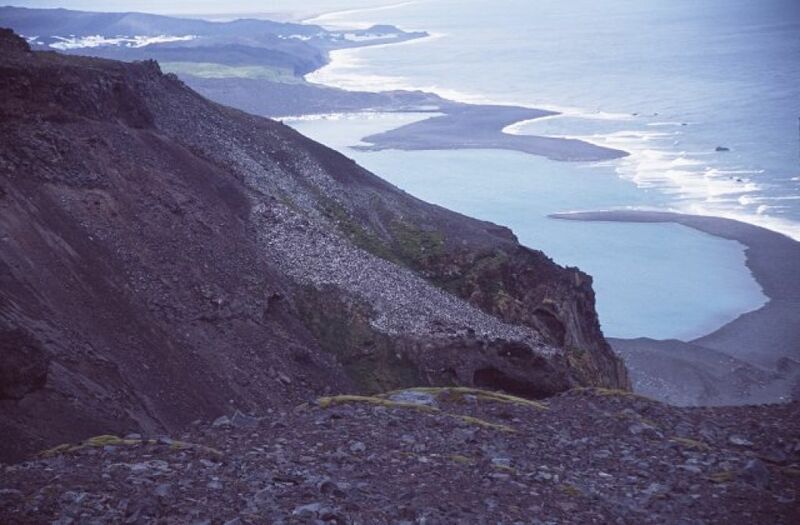 Recent volcanic activity has dramatically altered the McDonald Islands, approximately 40 kilometres west of the Laurens Peninsula. Sometime during the 1990s, the main island has doubled in size and increased in elevation, resulting in the complete loss of all vegetation on the island. Heard Island and the McDonald Islands lie south of the Antarctic Convergence, the marine zone where the colder waters of the Antarctic (surface temperatures of around 2°C) converge with, and sink under the slightly warmer (surface temperatures of around 5°C) waters of the subantarctic. Lying south of the Antarctic Convergence and surrounded by Antarctic waters, approximately 70% of Heard Island is permanently covered in glaciers with isolated vegetated headlands emerging between glaciers. The few islands in the Southern Ocean are biological hot spots characterised by very high numbers of breeding and non-breeding seabirds and marine mammals. Vast colonies of penguins and petrels co-occur with harems of elephant seals and fur seals that call Heard Island home. See the Maps page for a general map of the vegetation and wildlife colonies on Heard Island, and go to the Nature section of this website for more information.